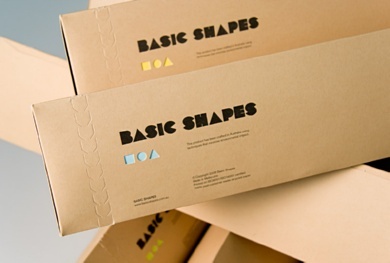 From COOP (Melbourne Agency): "A family of animal characters were created by combining the square, circle and triangle. The characters were silk-screened to a 1680 X 500mm modernist growth chart for kids. Honest, pure and devoid of superfluous details, the product imaginatively introduces kids to basic geometric learning and spark the imagination through the inclusion of memorable animal facts. The charts are compactly packaged in custom triangular cartons made from 100% recycled post consumer waste pulp."